The Wii U is Nintendo's eighth generation home console and was the first home console released in the generation. Unveiled during Nintendo's press conference at E3 2011 on June 7, the Wii U was released in North America on November 18, 2012, in Japan on December 6, 2012, and in Europe and Australia on November 30, 2012. The console launched with two models: The 8 gigabyte white "Basic Set", which comes with all basic accessories, and the 32 gigabyte black "Deluxe Set" (Premium Set in other regions), which comes with additional accessories such as a charging cradle, stands for the GamePad and console, and is bundled with one or two games. In early November 2016, after the announcement of the Nintendo Switch, it was reported that Nintendo would be ending production of Wii U consoles by the end of that week, November 4. Despite a Nintendo spokesperson claiming that the report was false, Nintendo later posted on its Japanese website that all currently available Wii U bundles at the time would be ending production in the near future. A representative from Nintendo would later confirm the news on the website, as well as stating that all Wii U hardware to be available for the next fiscal year in North America had already been shipped to retailers. On January 31, 2017, Nintendo of America confirmed that Wii U production had been discontinued globally, after an update on the Japanese website revealed that system production had ended for that region. The Wii U is the first Nintendo console capable of outputting high-definition video, able to natively display at 1080p resolution. The console can output video and audio via either HDMI output, or a Wii-compatible video output cable; however, the console cannot output video through both at the same time. The main feature of the Wii U is the Wii U GamePad controller, which has its own touch-sensitive display through which the console can output video in addition to the television screen. Using the GamePad, the player can interact with the game using the touch display, or play the game using the GamePad display rather than the TV. 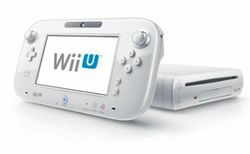 The Wii U features built-in backwards compatibility for the Wii, able to play all of the system's games and natively supports all controllers and accessories. While Wii controllers can be used in Wii U games, Wii games and software can only be played in "Wii mode", which takes the console to an emulated version of the Wii menu. Physical games for the Wii U are released on Wii U Game Discs, an extension of Nintendo's previous Game Disc formats. The format is similar to a Blu-ray disc, in that a Wii U Game Disc can hold up to 25 GB of data. Wii U games can also be purchased digitally and downloaded onto the system from the Nintendo eShop. In addition to original games, players can also download Virtual Console titles from the Nintendo eShop, as well as download versions of select retail Wii games. The Wii U is also backwards-compatible with all Wii titles, which can be played by accessing Wii Mode. This also applies to WiiWare and Virtual Console titles, which can be transferred to the Wii U's Wii Menu in Wii Mode using the Wii U Transfer Tool and Wii System Transfer tool, an internet connection, and an SD card. Select Wii games are also available as downloads on the Nintendo eShop, which still run in Wii Mode. The Wii U GamePad is the main controller for the Wii U. Its primary feature is the touchscreen, which can be used for both displaying the television screen, or be implemented for asymetric gameplay. The controller uses a modified Wi-Fi signal to connect to the console, which streams video to the GamePad. In addition to all of the standard buttons as seen on the Classic Controller, along with the power button and clickable control sticks, the Wii U GamePad also features an NFC sensor, headphone jack, external microphone jack, gyroscope, camera, and infrared sensor. The GamePad can also be used as a television remote. The Wii U Pro Controller is a more standard controller meant to be an alternative to the GamePad. It features the same standard buttons, but lacks most of the GamePad's features, including its touchscreen. The Pro Controller was released alongside the Wii U, though as a standalone product rather than being packed with the console. The Wii U Microphone is an accessory that allows for vocal input in compatible software. The accessory connects to the system through one of its USB ports. The Nintendo GameCube Controller Adapter is an accessory that allows players to use Nintendo GameCube Controllers with compatible Wii U software. The accessory connects to the console using two USB connectors, and the adapter features four Nintendo GameCube Controller ports. The adapter and Nintendo GameCube Controllers can only be used with Super Smash Bros. for Wii U.
amiibo are toys-to-life product that can unlock content and be used in other ways in various compatible games. They can be used with Wii U software by touching them to the NFC sensor on the Wii U GamePad. amiibo launched with the Super Smash Bros. line on November 21, 2014, the same day as the first amiibo-compatible game, Super Smash Bros. for Wii U. Being backwards compatible with the Wii console, the Wii U is compatible with all of the Wii's controllers and accessories, including the Wii Remote and Nunchuk, Classic Controller / Classic Controller Pro, Sensor Bar, and Balance Board. By extension, peripherals such as the Wii Wheel and Wii Zapper, can also be used with the Wii U. The Wii U is also compatible with USB-based Wii hardware, such as the Wii LAN Adapter and Wii Speak. The console's final design. Earlier builds of the console did not feature the logo. An earlier version of the Wii U GamePad. The tech demo New Super Mario Bros. Mii being played on the TV. The tech demo Zelda HD Experience being played on the TV, with the GamePad showing the inventory. ↑ 1.0 1.1 Wii U Launch Games (US). IGN. Retrieved June 12, 2016. ↑ 3.0 3.1 Wii U Production Has Officially Ended For Japan. Kotaku (January 31, 2017). Retrieved January 31, 2017. ↑ Hardware and Software Sales Units. Nintendo. Retrieved February 25, 2016. ↑ 5.0 5.1 Consolidated Sales Transition By Region. Nintendo (April 28, 2017). Retrieved April 28, 2017. ↑ The final Wii U will roll off Nintendo's production line this week. Eurogamer (November 1, 2016). Retrieved December 4, 2016. ↑ Nintendo Reportedly Ending Wii U Production This Week. IGN (November 1, 2016). Retrieved December 4, 2016. ↑ Nintendo Denies Wii U Production Is Ending This Week. Kotaku (November 2, 2016). Retrieved December 4, 2016. ↑ In Japan, Nintendo Announces Wii U Production Is Ending. Kotaku (November 10, 2016). Retrieved December 4, 2016. ↑ Nintendo Officially Announces Wii U Production Is Ending. IGN (November 10, 2016). Retrieved December 4, 2016. ↑ Wii U Launch Games (UK). IGN. Retrieved June 12, 2016. ↑ Wii U Discs Will Be 25GB In Size. Kotaku (June 7, 2011). Retrieved June 13, 2016. ↑ How to Transfer Content from a Wii to a Wii U. Nintendo Support. Retrieved December 4, 2016. This page was last edited on 4 November 2018, at 18:42.